The attrition of women from STEM careers has been attributed to many factors, such as work/life balance, biased hiring committees, and prejudiced editorial boards. But might it also be that women still do not see themselves as “real” scientists, or lack female role models? Miranda Hart reports on research examining women’s visibility in two high-profile scientific publications. Not only were men far more likely to be the corresponding author on scientific papers and more likely to appear as a featured scientist, there were also far fewer photos of women, even among advertisements and stock photos. Science journals continue to portray the image of a scientist as almost exclusively male, which undoubtedly trickles down to young girls, who are struggling to see where they fit in. I was flipping through an issue of Nature or Science one evening last year. I usually only read the essays and the newsy section up front. And I usually only read them when I’m at home, looking to relax. But on this particular evening, it wasn’t relaxing. I became increasingly agitated as I flipped through the issue before tossing it across the room, hitting my poor dog. The issue was (as my colleague delicately called it) a sausage-fest from cover to cover. There were long-form profiles of male researchers, opinion pieces by men, page after page of thumbnails of male researchers in the advertising feature for a university. The entire issue was a love letter to men in science. And the women? I recall an advert featuring a woman in a ballgown, wrapped in mythical DNA. But there wasn’t much else. If I was feeling disgust and alienation, I wondered what younger, more vulnerable people were feeling? Especially the young women on the cusp of deciding what career they could shoot for. What effect does being invisible in the media have on the career choices of young women? The attrition of women from STEM careers has been carefully observed for a couple of decades – it’s been called a “leaky pipeline” because while some STEM disciplines have gender parity during undergraduate programmes, the number of tenured faculty and PI remains highly skewed towards men. The factors behind this attrition likely represent many factors including work/life balance, biased hiring committees, and prejudiced editorial boards. But might it also be that women still do not see themselves as “real” scientists? A startling study last year showed that girls as young as six failed to see girls as being intelligent, compared to boys. Where are these messages coming from? As a young woman, I had no female role models growing up. None of my STEM teachers were women in high school. During my undergraduate degree in biology, I had one woman professor, but she taught only half a semester of introductory biochemistry. Even the science media celebrities were exclusively men. My coming of age as a scientist was a complete wasteland in terms of women mentors. Things didn’t improve in graduate school – all of my advisors from my Masters degree through to my post-doc were men, and I had exclusively men on all my supervisory committees. To compound the issue, men refused to treat me like a scientist – suggesting to me as a young graduate student that a lab tech was a good career goal. Or assuming I was an undergraduate during my PhD and PDF. Even today – well into middle age – colleagues at my university sometimes assume that I am a grad student. My journey to becoming a biologist was demoralising – it feels like a miracle that I’ve ended up a tenured faculty member at a university. Still, I am often seized by the conviction that I don’t belong. Most of the time I can suppress this fear, but it is frequently affirmed, like it was in the magazine I threw across my living room last year. I wonder if I would have felt a sense of belonging had there been visible evidence of women in the media – not as “women scientists” but just as “scientists”. Would simply inserting a few thumbnails of women in an issue of Nature help to change cultural biases implicitly? And as a corollary – were these journals, the world’s vanguards of scientific culture, guilty of simply showing men more often than women in their print journals? Image credit: Science et Vie, by brewbooks. This work is licensed under a CC BY-SA 2.0 license. I couldn’t let it go – the bad feeling I had after reading that magazine. But I know how confirmation bias works, and I was feeling particularly biased given the recent upswing of feminist discourse across disciplines and culture. So, I recruited a student to test it scientifically. We pored over three months of Nature and Science to find out if women were as visible as men within their pages. They were not. Men were far more likely to be the corresponding author on scientific papers, more likely to appear as a featured scientist. And not by a small margin – women made up only 15% of corresponding authors, and 8-27% of featured scientists. I expected this; given the dominance of men in higher academic positions it is bound to take time before we see material change in authorship. But I was surprised by the photographs. There were far fewer photos of women – even among advertisements and stock photos. The degree of male dominance in photos was not trivial, reaching 95% in some types of articles. Science journals themselves continue to portray the image of a scientist as almost exclusively male. What effect does this have on women, particularly young women struggling simply to see themselves as players in science? 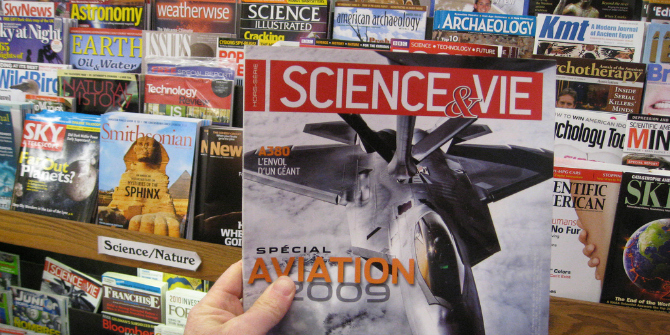 Clearly, girls and most undergraduate women are not regular readers of Science or Nature. But due to their impact, these journals have an inordinate influence on the culture of science, which undoubtedly trickles down to these girls, who are struggling to see where they fit in. This blog post is based on the author’s co-written article, “What a scientist looks like: Portraying gender in the scientific media”, published in Facets (DOI: 10.1139/facets-2017-0110).